← Instead of Aspirin, Ibuprofen and Acetaminophen . . . . There were a few years in my childhood when I looked forward to Shamrock Shakes from McDonald’s as a special March treat. And how bad could a milkshake really be? After all, isn’t it just ice cream and mint flavoring? It is important to know your ingredients and we almost never do when we eat food in restaurants or from packages. Many people don’t think about reading packaging, especially if the item claims to be low-fat, natural or healthy. Not that McD’s is claiming any of those– they are only claiming minty and creamy. A few days ago I started craving something minty, creamy and delicious but also nutritious. Yesterday it was a warm 70 degrees here in Denver and that was all I needed to finalize the inspiration for this Shamrock Smoothie Recipe. Compare its simple, whole-foods, nutrient-dense ingredients with the highly processed ingredients (fake foods, essentially) found in McDonald’s Shamrock Shake. Knowing which to choose is a no-brainer. Blend all ingredients until smooth. Serves 2. Delicious. Full of healthy fats, carbohydrates, fiber and enzymes. Free of preservatives, chemicals, food coloring, high fructose corn syrup and adulterated dairy. The second time I made this recipe I wanted to intensify the green without adding more avocado. A couple of handfuls of spinach did the trick and it didn’t alter the sweet, minty, refreshing flavor at all. This is a great way to get an extra serving of greens in for you or the kids. Enjoy! And if you have any recipes for healthfully re-imagined favorites, please share. 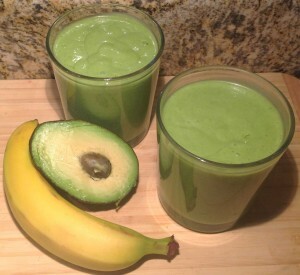 1Avocados and coconut milk are excellent sources of healthy fats. Eating avocados has been linked to lower BMI, body weight and waist circumference, higher HDL (“good” cholesterol) and reduced risk of metabolic syndrome according to a study published in the Nutrition Journal. 2I prefer Native Forest canned coconut milk because the can is free of bisphenol A (BPA), a substance that interrupts function of the endocrine system but is commonly used in plastics and to line food cans. A small amount of guar gum is the only preservative and there are no artificial vitamins added to this coconut milk so I will sometimes use it diluted with water instead of boxed coconut or nut milks as a dairy alternatives. 3 Not all essential oils available in supermarkets or even health food stores are high enough quality to take internally and often do not have the same health benefits. Peppermint is well known to improve digestion. The essential oil also helps to simulate and sharpen the mind as well as trigger satiety centers in the brain, helping you to feel satisfied and full. I started with 7 drops but wanted more mint kick and increased to 10. This is very minty, so start with a lower number and increase to taste. Before using essential oils internally, talk to a Certified Aromatherapist. 4For sweetening, I used about 1 tablespoon raw honey and 2 tiny scoops of stevia powder. The raw honey is rich in enzymes. When the source is local, it can help prevent allergies. Honey is also helpful in encouraging ideal body temperature. Stevia is very strong and can be bitter so use sparingly and look for brands that are pure stevia with no additives. This entry was posted in Natural Medicine, Nutrition, Nutritious Recipes. Bookmark the permalink.